The Belize flag features a blue background with two horizontal red stripes across the top and bottom edges. The center of the flag includes a white crest with two male figures standing barefoot on the grass on either side of the coat of arms, with a Mahogany tree sprouting up behind the coat of arms. The coat of arms shield is split into three sections; The upper left section depicts a paddle and maul over a white background, the upper right section includes a saw and axe over a yellow background. The bottom section shows a sailing ship on the blue ocean. The crest is surrounded by a circle of mahogany leaves. A banner bearing the words "Sub Umbra Floreo" sits at the base of the flag just below the feet of the two figures. 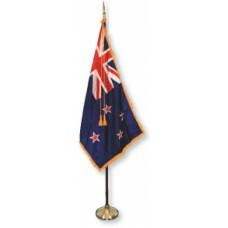 Of the two figures depicted on the flag, one is a mixed race (indigenous) male and the other is a Caucasian European male. The former is shouldering an axe and the latter an oar which symbolizes the county's association with boat building and logging. The tree emphasizes the historical importance of mahogany to Belize and the 50 mahogany leaves surrounding the scene are indicative of the year 1950 when opposition to British rule first began. The words on the banner, "Sub Umbra Floreo" translate to "under the shade, I flourish" referring again to the mahogany tree. 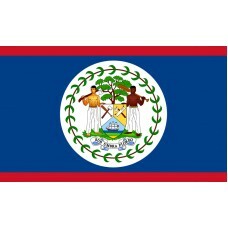 The main background color of blue on the Belize flag represents the The Peoples United Party (PUP) which was responsible for leading the country to independence. The red bands represent The United Democratic Party which is a national political party in Belize. The earliest known peoples of Belize were the Mayan Indians who have gained a reputation for being one of the most advanced civilizations of their time. Their achievements included the development of their own calendar and a form of writing called glyphs. Belize was was later used as a pirate hideout. The pirates used slave labor to harvest logs for use as lumber. What was at the time "British Honduras" became part of the British Commonwealth after the Second World War. Then the country became the independent nation of Belize following its exit from the British Commonwealth in 1981. 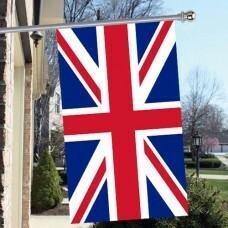 After the British left, the country continued with a democratic government system based on the UK style parliament and has continued as a peaceful nation. Belize has trading agreements inplace with the rest of the world including the USA and it is self-supportive because of its plentiful natural resources. Agriculture features prominently in the country's economy and makes up a substantial portion of Belize's exports. 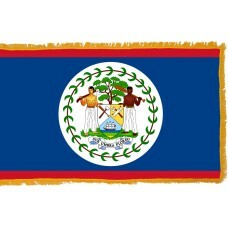 Construction is a growing part of the country's economy too, which is keeping in the tradition of logging and ship construction depicted in the Belize flag.